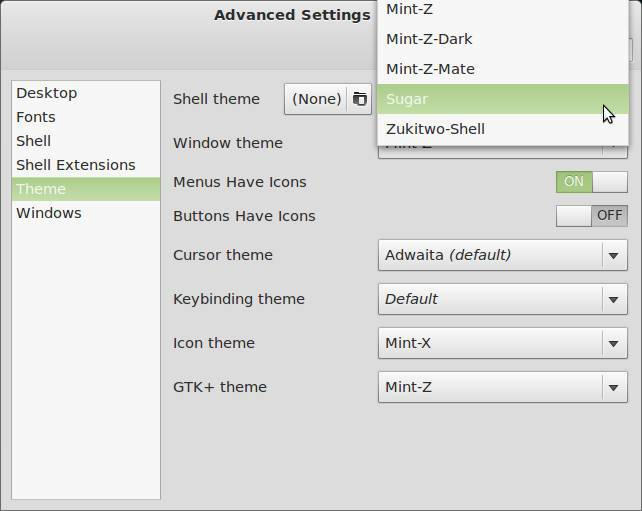 Sugar is a free gnome shell theme for linux mint. 2.Open Advanced settings. To open advanced settings, click Menu button and select Advanced settings or type Advanced settings in the search field and select Advanced settings. 3.Then select theme option and click Shell theme None button. 4.Browse and select Sugar gnome shell theme and click open. 5.After the successful installation of Sugar gnome shell themes, select it from Shell Theme Menu. If the changes doesn’t appear instantly then hit Alt+F2 and type r (and press Enter to reload the shell theme).